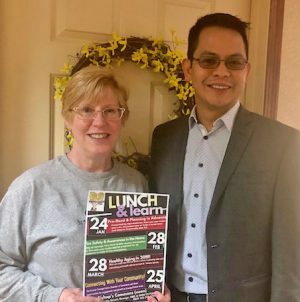 OSWEGO – Bishop’s Commons at St. Luke welcomes Dr. Renante Ignacio M.D to its next “Learn and Lunch” event on March 28 from noon to 1:30 p.m. This month’s “Learn and Lunch” features Dr. Renante Ignacio. From left: Karen Murray, executive director at Bishop’s Commons, with Dr. Ignacio. Dr. Renante Ignacio is a specialist in hospice, palliative care and geriatric medicine and serves as attending physician at Bishop’s Commons and Medical Director at St. Luke Health Services and St. Francis Commons. He will talk about strategies and lifestyle choices we all can practice to achieve and maintain health as we grow older, and some of the resources in our own community to help us address any adverse effects of aging in a loved one or ourselves. Because of the popularity of this program, those planning to attend should RSVP to Bishop’s Commons at 315-349-0799 by March 26.